Media monitoring and analytics services to meet YOUR specific needs. We measure our success by the ability of our clients to prove and improve their communications effectiveness. Helping our clients succeed is our passion. We listen to our clients and help them identify their communication needs, goals and objectives and then tie them back to business objectives. We’ve had thousands of satisfied clients over the years. But our focus is on what we can do to help your organization – now. All of our clients receive the complete capabilities of the Glean.info dashboard and we don’t require long-term contracts that force you to keep paying us if you are dissatisfied. At Glean.info we will earn your satisfaction every month! 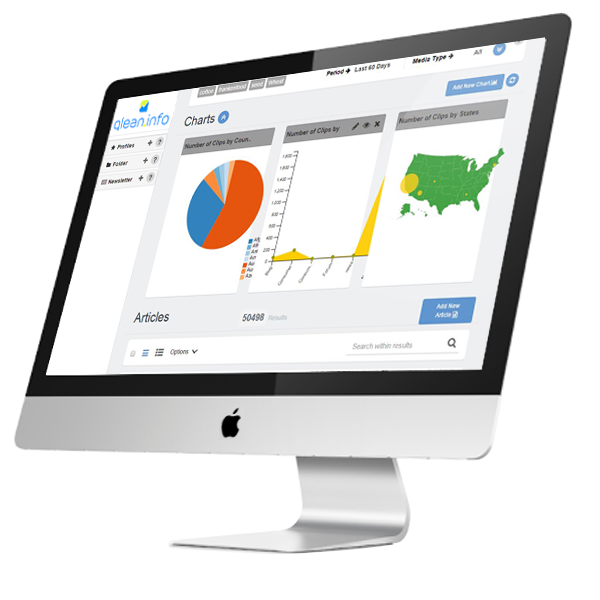 Glean.info provides media monitoring, measurement and analytics of social media, online news, broadcast news, and print. Our base platform monitors Twitter, Facebook, LinkedIn, Instagram, 65,000+ online news sources in 250+ languages worldwide, closed caption text of news programs on 1,000+ U.S. TV stations, 90+ million blogs, 100,000 message boards, 200+ video sharing sites enables organizations to track what people are saying about them. Glean understands that effective monitoring, reporting and measurement starts with accurate data. That’s why we created proprietary software that does a better job collecting news and social media content. The collection software feeds a state of the art indexing system to ensure we deliver clips that match our clients’ requirements. In addition to content we collect ourselves we acquire content from partners in order to assure that our clients obtain all the media mentions they want and need. We index only our own collectors but also data collected from partners in order to precisely target content that is valuable to you and not irrelevant spam content delivered but less sophisticated providers. Collect all media types to give you integrated access to media monitoring results. Security of knowing you’re on top of all issues affecting your company and brands because Glean.info updates your media mentions continuously 24 hours a day. Freedom from drudgery of searching social media sites each day. Allows for immediate response to social posts right from the base system. Safety of having your content stored in cloud-based archive with easy access and efficient management. A basic monitoring service provides all of the advanced user features of more expensive media measurement platforms. Includes advanced keyword search features to ensure the most accurate search results that virtually eliminate irrelevant or extraneous media items. Integrates your media items with advanced analytics for each type of media. Can be customized to your specfiic needs and requirements. No need to pay for services you don’t want and won’t use. Less costly than comparable services. Attentive service by knowledgeable, well-trained and respectful representatives. Sharable custom profiles with additional dynamic dashboards for other users. Multiple quantitative metrics for each specific media type. Thousands of user selectable chart formats: pie, bar, doughnut, line and multi-variable stacked or grouped line, bar and area charts to easily visualize your analysis. Sophisticated search capabilities from within the dashboard to create reports and archives. User created folders to create and archive specific reports, searches or newsletters for future recall.